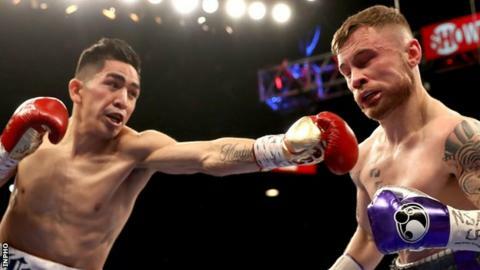 Leo Santa Cruz says he is "pretty sure" his much-anticipated third contest with Carl Frampton will take place in 2019. Northern Irishman Frampton beat three-weight world champion Santa Cruz in New York in July 2016 to land the WBA featherweight title. However, the Mexican avenged that loss by defeating the Belfast man six months later in Las Vegas. "I am pretty sure and positive it [a third fight] is going to happen next year," Santa Cruz told fighthype.com. Santa Cruz, 30, is hoping to fight in November before beginning preparations for a contest with Frampton. He said: "I want to get a fight [in November]. Whoever it is, I don't care. If I get the win, I [then] want to fight Carl Frampton. "People want that fight. I want that fight. I want to make a third fight against him. Carl Frampton....he wants that fight too." After being handed his sole career defeat by Santa Cruz in January 2017, Frampton said that the Mexican had given his word that he would travel to Belfast for their third meeting. However, Santa Cruz then said that he had been advised by his father and trainer Jose not to take on Frampton in Belfast because of concerns over a possible home town decision by the judges. Frampton later admitted that a Belfast contest between the duo was "realistically not going to happen" but the Northern Irishman remains determined to complete a trilogy against the Mexican. If the fight does happen, a return to Las Vegas appears the most likely option. Frampton is now promoted by Frank Warren after splitting with his long-term mentor Barry McGuigan last year. The Belfast boxer is taking legal action against McGuigan's Cyclone Promotions over money he says he is owed but is being counter-sued for breach of contract.